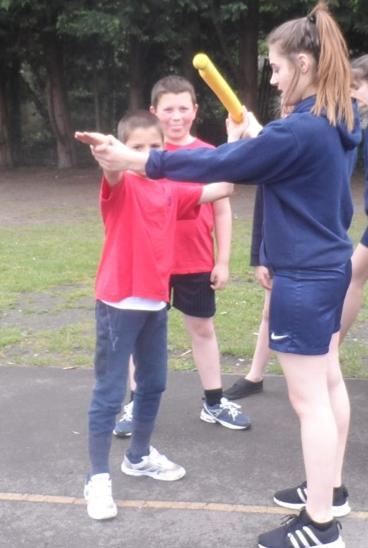 On Monday 15th and Friday 19th May, Sports Leaders from Cove Secondary School came to work with pupils from Years 3,4 and 5. The athletics activities organised by the Sports Leaders were exciting and fun. Thank you to the pupils and teachers at Cove Secondary School who made this wonderful opportunity possible. On May 19th, my birthday, Cove Secondary School Sports Leaders came to our school to teach us sports skills. The first event was hurdles. It was quite difficult but exciting at the same time, because I had never done it before. Next we played boules. We had to go on one knee and roll the boule. Then we did a relay. In my team was Sarwan, Christopher and Myles. This was my favourite because we came first. After that was javelin, we used rubber rockets for safety. We used one hand to aim and the other arm to throw. Another event was standing long jump. The aim is to jump the furthest. You have to remember to keep your legs together. Finally, we ran sprint races. We ran 20 metres as far as we could. I really enjoyed the day, we were pumped up with excitement. We learnt lots of new skills for the Sports Leaders. At the end of the day we were all smiling.